This is a real party-time drink. It’s ideal for a group, and any glass of fizz with a pink blush is bound to have a lot of frilly stage-presence. Live to Sparkle is a fun bottle complete with high-heels. 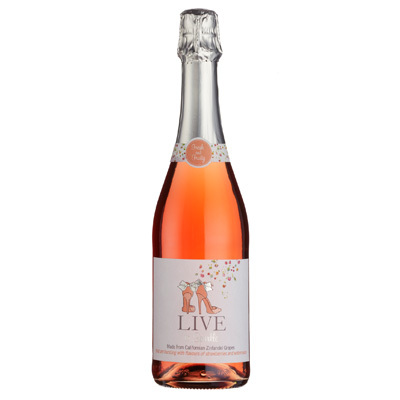 Live to Sparkle is light with pleasant fruit on the palate; strawberry and a hint of peach and a good complement of bubbles. This wine is made from Zinfandel grapes and it takes its characteristics from that variety. It uses tank carbonation of the still wine to produce this pink fizz. This isn’t a champagne as it uses neither the traditional method nor the grapes from that region. It is, however, a simple crowd-pleaser. This would be a welcome aperitif served well chilled in champagne flutes with perhaps a garnish of a couple of cherries draped over the rim. It’s unchallenging and ideal for party quaffing. Live to Sparkle isn’t a wine to discuss and evaluate but it is one to enjoy with friends.